John C. Moore is chief scientist at the College of Global Change and Earth System Science, Beijing Normal University, China; and professor of climate change at the Arctic Centre, University of Lapland, Rovaniemi, Finland. Rupert Gladstone is a geoscientist at the Arctic Centre, University of Lapland, Rovaniemi, Finland. Thomas Zwinger is an application scientist at the CSC-IT Center for Science, Espoo, Finland. Michael Wolovick is a glaciologist at Princeton University, Princeton, New Jersey, USA. If nothing is done, 0.5–5% of the world’s population will be flooded each year after 21002. For example, a 0.5-metre rise in Guangzhou, China, would displace more than 1 million people; a 2-metre rise would affect more than 2 million1. Without coastal protection, the global cost of damages could reach US$50 trillion a year. Sea walls and flood defences cost tens of billions of dollars a year to construct and maintain2. At this price, geoengineering is competitive. For example, building an artificial island to host Hong Kong’s international airport, which added 1% to the city’s land area, cost more than $20 billion. China’s Three Gorges Dam, which spans the Yangtze River to control floods and generate power, is thought to have cost about $33 billion. "By definition, geoengineering is not small-scale, but in terms of the comparison to existing civil-engineering projects it is not total science fiction." We think that geoengineering of glaciers on a similar scale could delay much of Greenland and Antarctica’s grounded ice from reaching the sea for centuries, buying time to address global warming. In our view, this is plausible because about 90% of ice flowing to the sea from the Antarctic ice sheet3,4, and about half of that lost from Greenland travels in narrow, fast ice streams. These streams measure tens of kilometres or less across. Fast glaciers slide on a film of water or wet sediment5. Stemming the largest flows would allow the ice sheets to thicken, slowing or even reversing their contribution to sea-level rise. Geoengineering of glaciers has received little attention in journals. Most people assume that it is unfeasible and environmentally undesirable. We disagree. We understand the hesitancy to interfere with glaciers — as glaciologists, we know the pristine beauty of these places. But we have also stood on ice shelves that are now open ocean. If the world does nothing, ice sheets will keep shrinking and the losses will accelerate. Even if greenhouse-gas emissions are slashed, which looks unlikely, it would take decades for the climate to stabilize. Is allowing a ‘pristine’ glacier to waste away worth forcing one million people from their homes? Ten million? One hundred million? Should we spend vast sums to wall off all the world’s coasts, or can we address the problem at its source? Geoengineering is a political and societal choice, because people’s reactions depend on how the issue is framed. Buttressing of glaciers needs a serious look. It should have fewer global environmental impacts than other proposals being discussed for reducing sea-level rise, such as injecting aerosols into the stratosphere to reflect sunlight and cool the planet. To stimulate discussion, we explore three ways to delay the loss of ice sheets. The Jakobshavn glacier in western Greenland is one of the fastest-moving ice masses on Earth. It contributes more to sea-level rise than any other glacier in the Northern Hemisphere. Ice loss from Jakobshavn explains around 4% of twentieth-century sea-level rise, or about 0.06 millimetres per year6. Jakobshavn is retreating at its front. Relatively warm water from the Atlantic is flowing over a shallow sill (300 metres deep) and eating away at the glacier’s base. Making the sill shallower would reduce the volume of warm water and slow the melting. More sea ice would form. Icebergs would lodge on the sill and prop up the glacier. A 100-metre-high wall with sloping sides of 15–45° could be built across the 5-kilometre fjord in front of Jakobshavn glacier by dredging around 0.1 cubic kilometres of gravel and sand from Greenland’s continental shelf (see ‘Glacial geoengineering’). This artificial embankment, or berm, could be clad in concrete to stop it being eroded. The scale of the berm would be comparable with large civil-engineering projects. For example, ten times more material — 1 cubic kilometre — was excavated to build the Suez Canal. Hong Kong’s airport required around 0.3 cubic kilometres of landfill. The Three Gorges Dam used 0.028 cubic kilometres of cast concrete. Construction would be arduous and potentially hazardous in cold waters littered with icebergs. The reactions of local people would be mixed: although the project would create employment, large numbers of outside workers would have to be brought in. Ecology, fisheries and tourism could be affected. Glacier sediments supply nutrients for plankton growth, so marine ecosystems would be affected by increased turbulence during construction of the berm and by the loss of sediment once the glacier was slowed. Building such a berm would tell us whether glacial geoengineering is feasible, or if there would be unanticipated consequences. 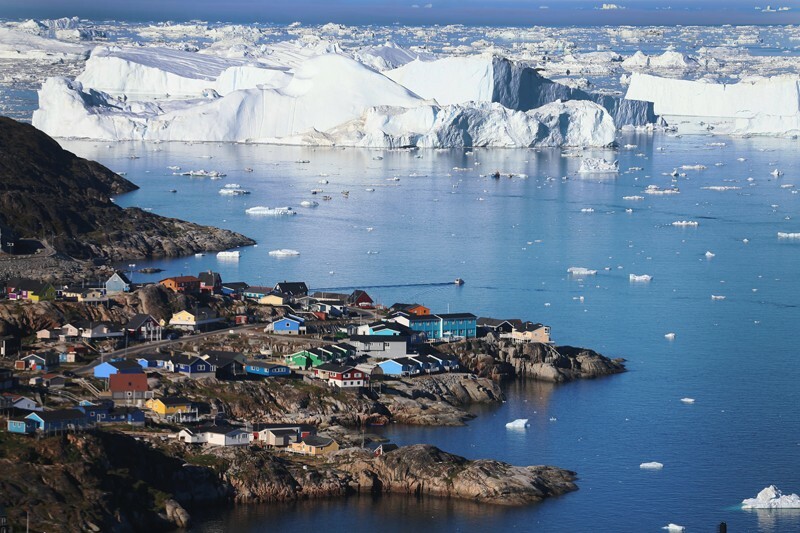 But the project would have only a small impact on 2100 global sea levels, given that Greenland’s contribution is likely to be just 10–20 centimetres1. Antarctica will be the largest contributor, and geoengineering there will require larger and more challenging projects. Where Antarctica’s ice sheets reach the sea, ice flows out as floating shelves. Pinned by rocks and islands, these platforms hold back the glaciers and limit how much ice reaches the sea. As the air and ocean around Antarctica warm, some ice shelves are becoming thinner, particularly those fringing the Amundsen Sea. In 2002, scientists were shocked at the collapse of 3,200 square kilometres of the Larsen B ice shelf, which is now only 30% of the size it was during the 1980s7. Half a dozen other shelves around the Antarctic Peninsula have shattered in the past 30 years. Sheer cliffs are left behind when an ice sheet collapses. These crumble, accelerating the glacier’s retreat8. The West Antarctic ice sheet is especially vulnerable because its bedrock lies below sea level and is deeper inland9. Warm ocean currents in the Amundsen Sea are melting the bottoms of floating parts of the glaciers, making the sheets more unstable. The Pine Island3 and Thwaites4 glaciers in West Antarctica are the largest potential sources of sea-level rise over the next two centuries. Both glaciers are losing height and flowing more quickly than two decades ago. Pine Island Glacier reached a flow rate of about 4 kilometres per year in 2009, compared with 2.5 kilometres per year in 199610. 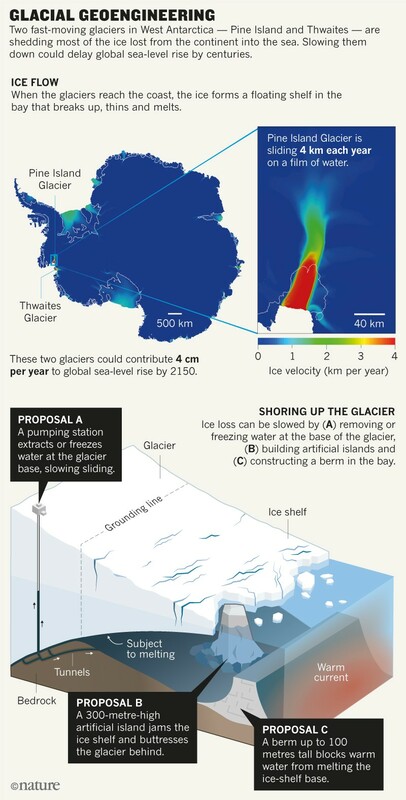 Models predict that, by 2150, these two glaciers might disgorge ice ten times faster than current rates, contributing 4 centimetres a year to global sea-level rise8. One solution is to artificially pin the ice shelves in front of the two glaciers by constructing berms and islands, extended from outcrops or built on the sea floor. For example, the shelf buttressing Pine Island Glacier could be jammed by a berm located on Jenkins Ridge, a high point on the sea bed below the glacier. We estimate that this would require around 6 cubic kilometres of material, or 60 times more than would be needed to plug the Jakobshavn fjord. Relatively small artificial islands in other places — reaching up 300 metres from the sea bed — would require 0.1 cubic kilometres of material each. A large berm (10–50 cubic kilometres) in the open bay could prevent warmer waters from entering. Whether such engineering feats would successfully delay sea-level rise, and for how long, requires a better understanding of many factors. These include how the ocean circulates below ice shelves; how floating ice fractures and calves icebergs; and how glaciers slide and erode at their bases. A thorough study would be needed to determine the stresses that pinned ice shelves can sustain before they fracture. Models of ice dynamics should determine the most effective locations for pinning. Material could be shipped to Antarctica from elsewhere in the world, or dredged or quarried locally. But it would be difficult in practice for engineers to work around the ice shelves, which grow and shrink as the glaciers, sheets and conditions fluctuate. Sea ice would also get in the way. Technologies might need to be developed to operate beneath floating ice. Major disturbances to local ecosystems would be expected and would require thorough assessment before and after pinning. Fast-sliding ice streams supply 90% of ice entering the sea. As the ice slides over the glacier bed, frictional heat generates about 90% of the water at the base of the ice streams5. This water acts as a lubricant, speeding up the flow, which in turn generates more heat, and creates more water and slippage. Glaciers in Greenland and at lower latitudes are relatively wet because their surfaces melt in summer, and rivers flow beneath them. In Antarctica, by contrast, there is little seasonal melting and much less water below the ice sheet. For example, the base of Pine Island Glacier releases about 50 cubic metres of water per second, which is only about 10 millimetres per year over the catchment area5. Removing this thin layer of water will slow the glacier, reducing frictional heating. The glacier will stall and its ice will thicken. It is difficult to access the glacier’s bed beneath one kilometre of ice, but there are precedents. The IceCube Neutrino Observatory at the South Pole has used jets of hot water to drill 60 holes to depths of 1,500–2,500 metres in the ice sheet. At Engabreen, Norway, a network of 5-metre-wide tunnels in the bedrock feeds 30–40 cubic metres of meltwater each second from the base of a glacier to the Svartisen hydropower plant. On the basis of current similar projects, we estimate that the cost of drilling the tunnels through rock beneath the Engabreen glacier was around $500 million. Deeper subglacial water in Antarctica is under pressure and should drain to the ocean without pumping. It could also be frozen by circulating cooled brines beneath the 10-metre-thick layer of sediment scoured at the glacier’s base. The Pine Island Glacier might be reached through the nearby volcanic outcrops of the Hudson Mountains. These lie within 80 kilometres of the glacier and the coast, and would be a good base for research into the sub-glacial environment and ice shelves. Again, the costs of such projects appear comparable to those of other large energy and civil-engineering works. Glaciologists and engineers should establish the scientific viability of these projects through fieldwork and computer modelling. The glaciers concerned need extensive study, including mapping the geomorphology of their beds and the rates at which they are melting. More observations are needed of the North Atlantic’s flow onto the Greenland shelf. Climate models need to do a better job of simulating the Southern Ocean. Potential risks, especially to local ecosystems, need careful analysis. In our view, however, the greatest risk is doing nothing — or if the interventions don’t work. The impacts of construction would be dwarfed locally by the effects of the ice sheet’s collapse, and globally by rapid sea-level rise. Unexpected consequences might arise. For instance, if water at a glacier’s base is trapped in pockets, some parts of the glacier or ice stream might speed up rather than slow down. Implementation would require global consent. Antarctica is governed by the Antarctic Treaty, so research there is undertaken within the multilateral framework of the Scientific Committee on Antarctic Research, which meets this June. Countries finance research on the basis of their interests, and a few could take a lead. For example, researchers in China are preparing a $3-billion plan for polar research in the next decade that includes addressing the feasibility of targeted geoengineering schemes such as ours. Options for building a research base in the Hudson Mountains, to access the glaciers flowing into the Amundsen Sea, should be discussed. Around Greenland, sea levels will fall as ice is lost from its interior, reducing the gravitational pull of the ice sheets. This could be as inconvenient for coastal communities as rising seas. There might be mutual benefits to collaboration between Greenlanders and those who are most at risk of rising sea levels, for example in the small island states of Tuvalu or the Maldives. Geoengineering of glaciers will not mitigate global warming from greenhouse gases. The fate of the ice sheets will depend on how quickly we can reduce emissions. If emissions peak soon, it should be possible to preserve the ice sheets until they are again viable. If they keep rising, the aim will be to manage the collapse of the ice sheets to smooth the rate of sea-level rise and ease adaptation. Jevrejeva, S., Jackson, L. P., Riva, R. E. M., Grinsted, A. & Moore, J. C. Proc. Natl Acad. Sci. USA 113, 13342–13347 (2016). Hinkel, J. et al. Proc. Natl Acad. Sci. USA 111, 3292–3297 (2014). Favier, L. et al. Nature Clim. Change 4, 117–121 (2014). Joughin, I., Smith, B. E. & Medley, B. Science 344, 735–738 (2014). Joughin, I. et al. J. Glaciol. 55, 245–257 (2009). Joughin, I., Abdalati, W. & Fahnestock, M. Nature 432, 608–610 (2004). Cook, A. J. & Vaughan, D. G. The Cryosphere 4, 77–98 (2010). DeConto, R. & Pollard, D. Nature 531, 591–597 (2016). Mercer, J. H. Nature 271, 321–325 (1978). Joughin, I., Smith, B. E. & Holland, D. M. Geophys. Res. Lett. 37, L20502 (2010).